Since its debut in January, HBO's "True Detective" has captured a great deal of attention, all of it richly deserved. In the past month, the Internet has come alive with everything from Tumblr parodies to conspiracy theories and thoughtful examinations of "True Detective's" literary and philosophical underpinnings. And though the praise for stars Woody Harrelson and Matthew McConaughey has been almost unanimous, an intense debate has erupted around the show's depiction of nearly everyone who is not one of the two white detectives at its center. The women -- the ones who aren't dead -- are clearly not the focus of the show. They're usually seen when they're arguing or sleeping with the men. Even critics who admire the show's strengths and aesthetic accomplishments recognize its limitations when it comes to its women, who represent a familiar array of cable-drama types: "crazy" mistresses, nameless strippers, randy hookups, disgruntled daughters, dismayed wives. To a lesser extent, critics have also noted the spotty depiction of "True Detective's" non-white characters. Two African-American detectives questioning Marty Hart and Rust Cohle have had a fraction of the screen time of Harrelson and McConaughey's characters. The debate around these issues has been necessary and illuminating, but it's a conversation that has become distressingly familiar. Similar complaints have been lodged against other high-profile and often acclaimed dramas such as "Breaking Bad," "Ray Donovan," "Mad Men," "Rescue Me," "The Newsroom," "Game of Thrones," "The Sopranos" and on and on. Maybe it's time for a different conversation. It might be useful to take a break from talking about what individual dramas are doing and talk instead about what HBO -- and other critically acclaimed TV outlets -- are not doing. HBO is one of the most highly regarded entertainment brands in the world. During its "Sopranos" heyday, it represented the gold standard for TV dramas, and its shows still frequently dominate pop culture and critical discussions. Even though the TV universe is expanding in a multitude of directions, what HBO does -- and doesn't do -- matters a great deal. The list below identifies the one-hour dramas and dramatic miniseries that HBO has aired between 1975, when the network went national, and April 15, 2014. Below each program is the name of its creator(s). If no "created by" credit exists, the list identifies the person who was considered the project's lead writer, chief adaptor or lead developer. These were the people in charge of the storytelling at the time of the program's debut; let's call them the "narrative architects." Even in HBO's current, post-"Sopranos" era, as the network endeavors to craft a new identity for itself, the picture hasn't improved. Actually, it's gotten worse. 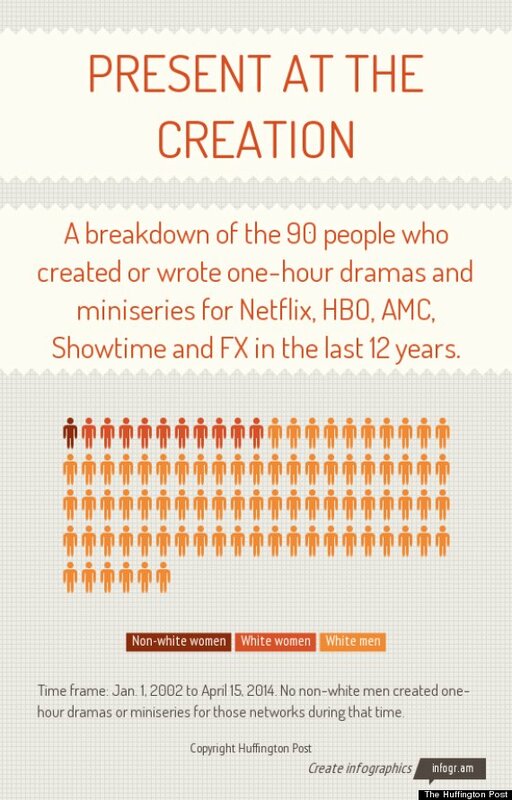 Guess how many women or people of color have been a creator or narrative architect on a one-hour HBO drama or miniseries since 2008 (the year after "The Sopranos" ended)? There are a number of reasons for the existence of problematic female characters, but this lack is one of them. It's also self-evident that the people at the top networks and television studios have much more power than Nic Pizzolatto, the creator of "True Detective," or any other single HBO creator or showrunner. Audiences can and should take individual writers to task for problems they perceive in a given show. But as long as this debate is limited to individual dramas, and doesn't consider the entities that commission and distribute them, the conversation is likely to go around in circles indefinitely. "We can do better; we are doing better; we are striving to do better," an HBO spokesperson told HuffPost via email. "We have just launched a new program called HBO Access that seeks emerging, diverse filmmakers ... and we are currently developing new programming with such talent as Oprah Winfrey, Steve McQueen, Jenji Kohan and many others." The spokesperson added, "When you look beyond drama series and mini-series at the many other programming genres that we present, such as comedies, documentaries, late night fare, sports and original movies, I think you will find a lot of diversity." The network went on to cite programming such as "The Chris Rock Show," the TV movie "The Tuskegee Airman" and John Leguizamo's special "Ghetto Klown." To put the homogeneity of HBO's decision-making in context, HuffPost looked to the other big players in the prestige TV game. Once again, the focus was on original series (not imports), specifically one-hour dramas and dramatic miniseries, i.e., the prime real estate of TV culture. In TV's most recent Golden Age, AMC, FX, Showtime, Netflix and HBO are among the leaders of the pack. Half-hour shows aren't unimportant, but the dramatic fare from these five entities represents the major pillars of popular culture: Their programs not only capture the public imagination, but often cement or increase the power of the people who make them. Of course these numbers are not exact, scientific or comprehensive. The lists here are restricted to five networks or platforms, and one of them (Netflix) has only been in the game a few years. TV is also a collaborative art form: The creators, developers and narrative architects listed here weren't solely responsible for a given program's content. Women and people of color are or were employed -- sometimes in important capacities -- on many of these shows. So it's certainly possible to slice and dice names, titles and job responsibilities differently. But it's unlikely that a list, for example, of every person who held the title of "executive producer" at the time of a drama or miniseries' debut would look significantly different in its percentages. Even as a snapshot of the industry, however, the numbers tell a clear story about who gets the keys to the fanciest car, culturally speaking. At the outlets responsible for many top programs, women and people of color are enormously under-represented as creators. If one focuses only on the last dozen years at AMC, FX, Showtime, Netflix and HBO, around 12 percent of the creators and narrative architects in the dramatic realm were women. According to the Women's Media Center, "Shows with no women creators had casts that were 41 percent female. Shows with at least one female creator had casts that were 47 percent female." Given how few women and people of color are present at a show's creation, is it any wonder we can't escape this debate? And so we find ourselves in one of those closed loops that "True Detective's" Rust Cohle described in one of his most memorable philosophical digressions. We go around and around, talking about individual characters and the missteps of particular shows. We wonder why women are too often depicted as nags, flunkies or side salads. We wonder why women often get less to do, have less to say and so often feel the impulse to take off their shirts. We wonder why people of color aren't often depicted with compelling emotional lives or as complicated characters. 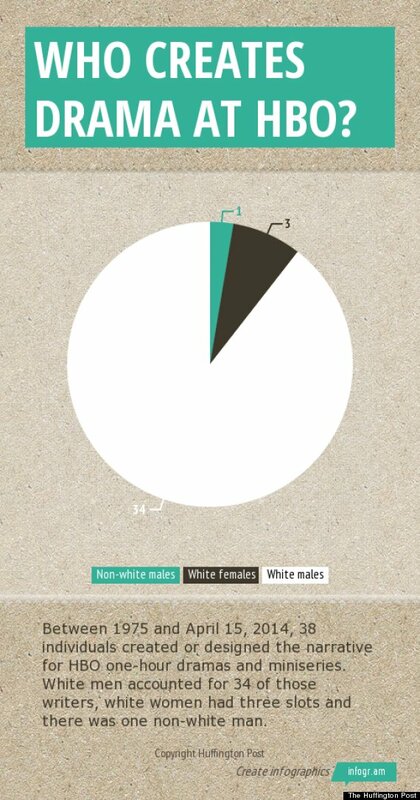 We wonder why non-white men and women are hardly ever the protagonists. If the dictum of good writing is "write what you know," what do women and people of color know? What dreams and nightmares do they have? What are their battles and fantasies? What stories aren't we hearing from them? I love "True Detective" and many, many shows that delve into similar questions. I recognize that men are entirely capable of writing good female characters, and that white people can write quality roles for characters of color (but let's not kid ourselves, it doesn't happen often enough). But when networks go to the same wells again and again, it starts to seem like the narrative concerns of programs created by men are the only narrative concerns that matter. They're not. Simply from a commercial perspective, the short history of Netflix's original programming is instructive: "Orange Is the New Black," which was created by a woman, has helped put Netflix on the map because its stories and characters were not what TV viewers usually see. If the companies that commission TV shows want to stand out in an increasingly competitive environment -- or perhaps would like to cater to an American population that is half female and will soon have a non-white majority -- don't they need, or possibly want, as many fresh voices, ideas and perspectives as they can get? It's not as though nothing is changing. As noted in my end-of-year Top 10 list, a number of current dramas feature complex, interesting women, and more platforms seem willing to tell offbeat or unusual stories about a more diverse array of characters. And it's possible that the networks have some dramas in development that are being made by women and people of color. Some of those shows may actually make it on the air. If that happens, swell. But what little change is happening has been glacial in most areas. According to the most recent stats from the Writers Guild of America, about 30.5 percent of TV staff writers are women, and about 15.6 percent of TV writers are people of color; both numbers represent modest gains from the past. San Diego State University's Center for the Study of Women in Television and Film, which uses a different calculation method, puts the percentage of female TV writers for the 2012-13 season at 34 percent. Yet according to SDSU's most recent study, 27 percent of women bear the title executive producer, and 24 percent are a "creator" -- numbers that have remained stagnant for a long time. In the 2010-11 season, "just 24 percent of the pilots in the pipeline for the season had at least one woman writer attached, while only 9 percent of the projects had at least one minority writer," according to the WGA. A reminder: At the prestige networks, in the dramatic arena, those numbers are generally lower. A lot lower. Years of writing about these issues and talking to writers and producers on and off the record have made a few things clear: Far too many in Hollywood are willing to tolerate tokenism in writers' rooms. (What's it like to be the "diversity hire," who is often low-ranking and lacks power? It's often like this.) Far too few studio and network executives actively and consistently pursue a true diversity of ideas and personnel when choosing which storytellers to hire and which stories to tell. Shonda Rhimes should be applauded for addressing these problems in blunt public comments, but if you're less powerful than she is -- and most aspiring creatives are -- there's a good chance you could be penalized for speaking up about this kind of stuff. The industry's unwillingness to make serious and lasting changes to the way it does business makes sense from a certain perspective. Business as usual for the Hollywood decision-makers has no concrete, short-term downside. On the rare occasions when they're asked about these matters, many executives pass the buck: It's always somebody else in the Hollywood food chain who is responsible. Or they trot out a series of Hollywood chestnuts: It's a meritocracy, the best work always rises to the top, everyone gets an equal shot, if only more women and people of color wanted to get in the game, our door is open to everyone, there is no problem, not really. Nothing to see here. This is a narrative in which powerful media executives portray themselves as unwitting bystanders: They just can't help the way things are. But aren't they the ones who control the meta-narrative (not to mention the enormous budgets)? From where they stand outside the universe of individual shows, do they not see this pattern, this flat circle? But as is the case with Cohle's partner, Marty Hart, maybe it's easier for executives and the media conglomerates that pay them to look away, and to come up with a story in which things just worked out a certain way and nobody is to blame. To be clear, HBO isn't the whole story. A few outlets aren't the whole story. But these numbers mean something. When audiences want to check on the state of high-end drama -- TV that examines, articulates and interrogates the human condition -- these places are among the first places they look. They're among the outlets that tell us who we are and who we could be. The kind of places that are supposed move the ball forward when it comes to the evolution of the art form. Many at the head of the pack, however, are behind the curve. The following list of original one-hour dramas and dramatic miniseries debuted on HBO, Showtime, AMC, FX and Netflix in the noted time frames. The people identified here are the creators, writers or narrative architects of a show when it debuted. Inclusion is not necessarily related to an official title. When a "created by" title was available, that was used. When a "created by" was not available, the project's writer was identified (when a project had only one or two writers, as is often the case for miniseries). When neither option was available, the networks were asked to identify the individual who served as the narrative architect -- chief adaptor/lead developer/head writer/showrunner, etc. -- at the time of a program's launch. The following list includes programs created by the main HBO network in the U.S. It does not include imports (from other countries or other branches of HBO), half-hour series, talk shows, TV movies, sports series, documentary series, family and children's programming or anthology series like "Tales From the Crypt." The list is restricted to original one-hour dramatic series and dramatic miniseries between 1975 and April 15, 2014. "The No. 1 Ladies Detective Agency"
From 1975 to April 15, 2014, 38 people created or were the narrative architect of a one-hour drama series or dramatic miniseries for HBO at the time of the program's premiere. Of those, 8 percent were women (Mort, Morgan and Kaye). Of those three, only one woman, Mort, created a drama series (which ran for one season). During that timeframe, HBO aired 17 one-hour dramas created by men, and only one creator/narrative architect (2.6 percent) was a person of color. From Jan. 1, 2002 to April 15, 2014 (the time frame for the FX and Showtime lists below), 31 people created or were the narrative architect of an HBO original drama or miniseries. Two (or roughly 6.5 percent) were women; not one was a person of color. Developed for television by James Manos Jr.
During that time, 23 people created or were the narrative architect of a Showtime one-hour drama or miniseries at its premiere. Of that group, six were women (26 percent). No persons of color. Original programs, as above, that premiered between Jan. 1, 2002 (the year FX began broadcasting original one-hour programs) and April 15, 2014. During that time, 22 people created or were the narrative architects of an FX one-hour drama or miniseries since its premiere. Of that group, one was a woman, who has since left the show (4.5 percent). No persons of color. AMC's programming, as above, belonging to the network's current era of original programming, premiering between June 25, 2006 (the debut of "Broken Trail") and April 15, 2014. During that time, 11 people created, developed or were at the creative helm of an AMC drama or miniseries when it began. One was a woman; one was a person of color (each 9 percent). From the network's current era of original programming. Ryan McGee and I discussed the story above (as well as "Sirens," "Suits" and "Bates Motel") in the most recent Talking TV podcast, which is here, on iTunes and below.